He said it was in software. I'm having problems with configuring those analog inputs. Does autoprom have to be in APU mode for them to work? I'm datalogging LT1 PCM using V3.8.adx. It works fine when autoprom is set in pass-thru mode. When set to APU (with settings changed in tunerpro accordingly), datalogging shows random, garbage data. Do I need to use different ADX when in APU mode? Pardon my ignorance, but I have searched on how exactly to connect the LC1 to the APU1. What wires need to be connected where? Does anyone have a diagram? You only need 2 wires from your WBo2 to the APU1's ADC connector. Analog signal voltage is normally 0 to 5v. Just need the Ground and Signal wires connected. "2. The BLUE and WHITE wires should all be grounded together to a solid ground source. Thebest possible ground source would be the battery ground (-) post." "6. Optionally, the YELLOW (Analog out 1) and/or BROWN (Analog out 2) can be connectedto the analog inputs of other devices such as data loggers, ECUs, or gauges. If either one orboth of these wires are not being used, isolate and tape the wire(s) out of the way." Just recently got an lc-2 on amazon for $149. First WB to APU1. I've read some where saying to wire a relay in. #1 is relay needed? #2 could you run controller GRD to APU1 GRD/ then 12 foot wire from APU1 to battery? Or should they both be ran up front to GRD. Got the lc-2 wired up and working,I'm pretty sure adx file is setup correctly and using correct channels,I ran both grounds to the same lug on the block. But my readings in tunerpro are about .5 higher than innovates Logworks software. Anyone else ever have this problem ? Yeah I know that's an option even for the 165' ecm I have. But there has to be another way around it while using APU1.My guess you use ecm now for wideband? Does it help to recalibrate wideband for 0-5 volt being 10-20? I'd rather use APU1. I have followed your directions and tried several times but can not get it to save. It will save everything but the equation. Any ideas why? Thanks to this thread I figured out my wideband. The analog AEM 0-5v is only accurate from 0.5-4.5v. So of the 1024, 0-102 and 921-1024 should be ignored when figuring the 9.5 AFR difference (8.5-18 sweep), 9.5 / 819 = .01159951. So for an AEM 30-5130 Analog Wideband the equation is (X * .0115991) + 7.3125. I checked it against the table in their PDF and it is good to go. Hopefully this can help someone in the future. Cause it definitely tripped me up. Ok, I fired the car and I'm getting strange results in my log. Wondering if it may have something to do with the age of my Autoprom - I got it used in 2010. There are jumpers for gain at 0.3x and 1x that I am unfamiliar with. Anyone seen these? Also, I'm using channel 3 but packet 65 seems to be the best match. AFR jumps from 7-16:1 about every half second while the gauge shows 12. I'll put a multimeter on it and check the wires themselves too. I may have missed it and this may be a dumb question but... is all this the same for the LM-2? Ok, I found this how-to on the Moates site that shows the old Firewire adapter. The 0.3gain is to use 0-12v inputs (I don't know why I didn't think of that.) So I put on 1x gain, but it's still not working. Checked the leads from the wideband with a multimeter and they are correct. I set up my ADX to read AFR, V and raw # for the 3 packets and swapped the wires all over and it's nowhere near accurate at any of them. I found a replacement Firewire deal on Moates, but I'm wondering if there's any way to check if it's the adapter or the Autoprom itself. Any idea? I forgot to update this with a fix. I got some support from Dave at Moates. 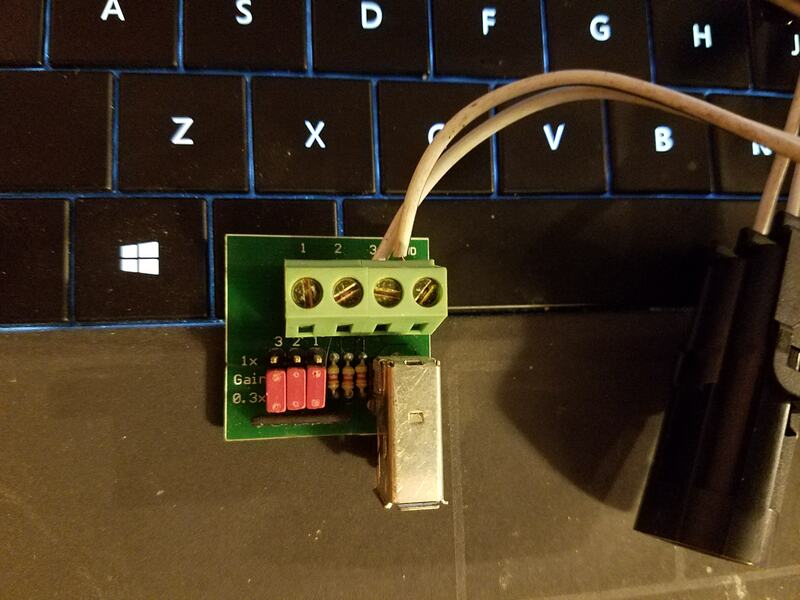 He said those adapters never go bad, and he has never seen issues with the input channels on an Autoprom that didn't have a bunch of other problems. He took a look and my problem was the "body size" in the ADX I downloaded. It was 66 and should have been 67.